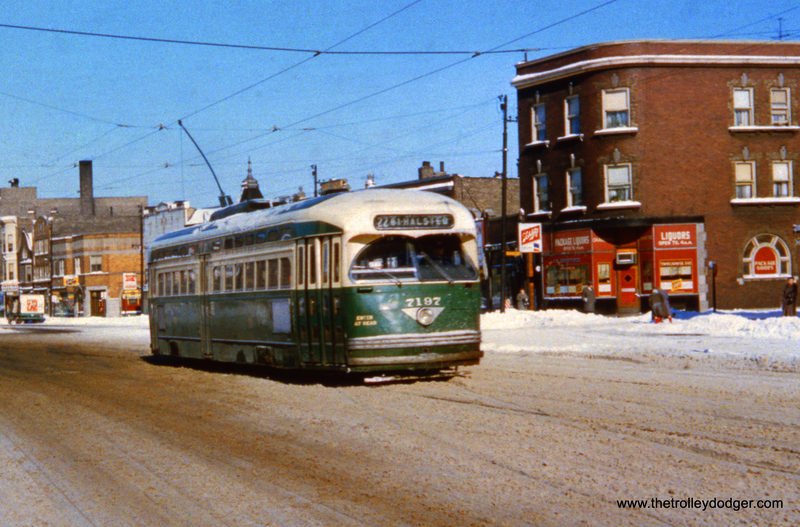 CTA 3182 and 660 at Cottage Grove and 115th in December 1951. This was the south end of route 4. The Illinois Central Electric is up on the embankment. 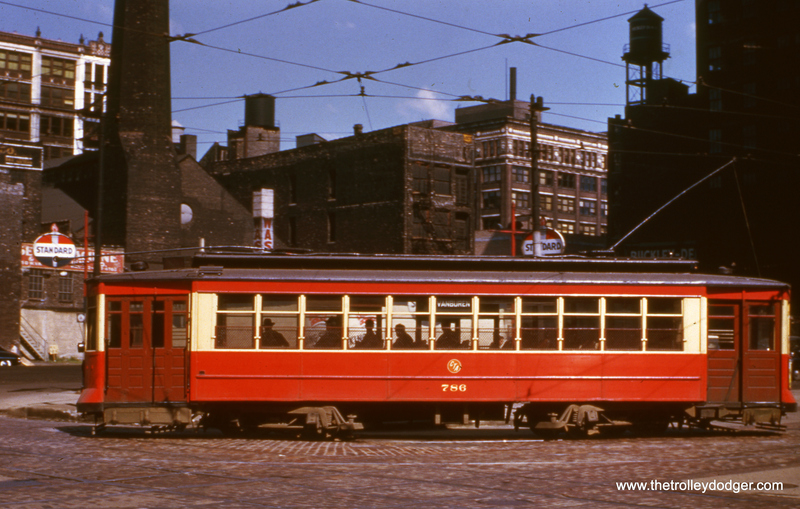 For our latest post, we have a collection of nice color images of classic Chicago streetcars, both red cars and PCCs. We have spent many, many hours working to improve the quality of these images, including both color correction and restoration, plus quite a bit of tedious “spot removal.” We feel the results, while not always perfect, are a great improvement compared to how they looked when we got them. 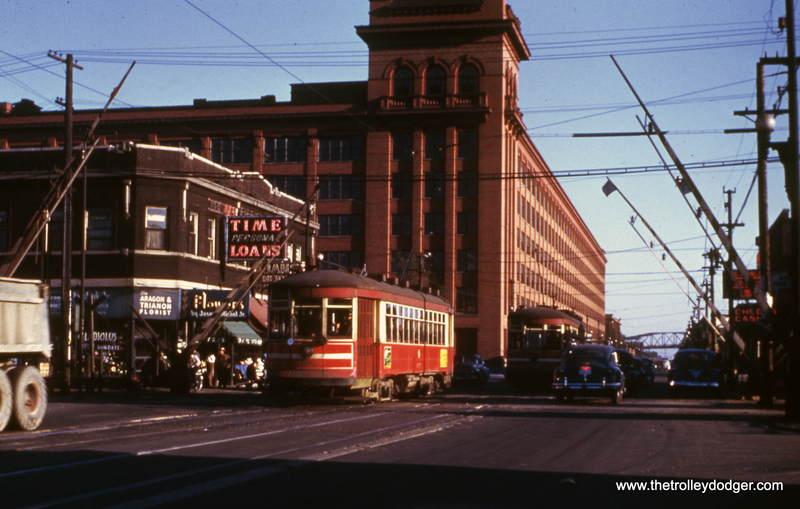 PS- To see earlier posts in this series, type Chicago streetcars in color in the search window at the top of the page. 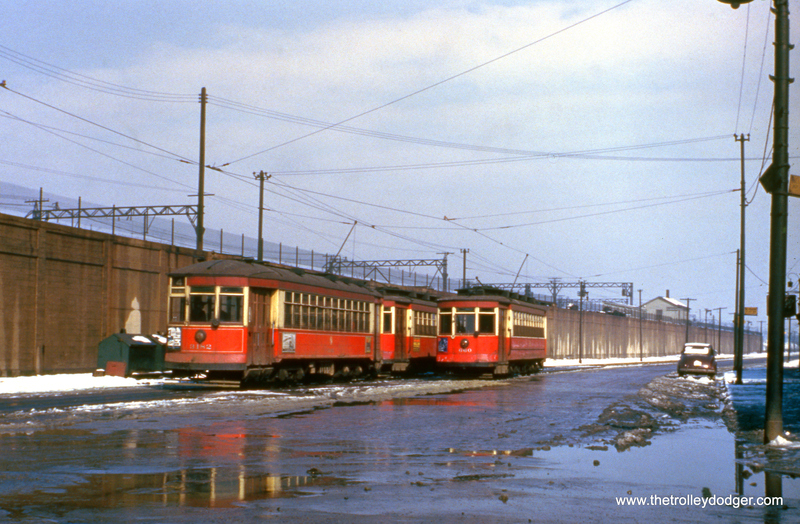 CTA 7116 on the Museum Loop trackage near Soldier Field in January 1954. This would have been a short-turn on route 22 – Clark-Wentworth. These tracks were built in the early 1930s to serve the Century of Progress World’s Fair. In CERA Bulletin 146, there is another picture of this same car on the Museum Loop in 1951. It’s dark, but you can just make out an Illinois Central Electric train at right. 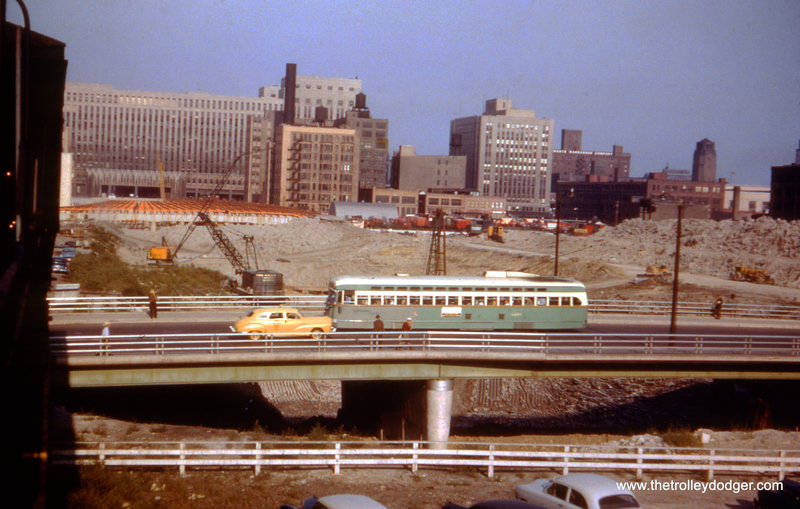 CTA PCC 7058 crossing the Congress Expressway construction site on Halsted in May 1952. A Pullman-built PCC at the same location. Here, the bridge has been completed. 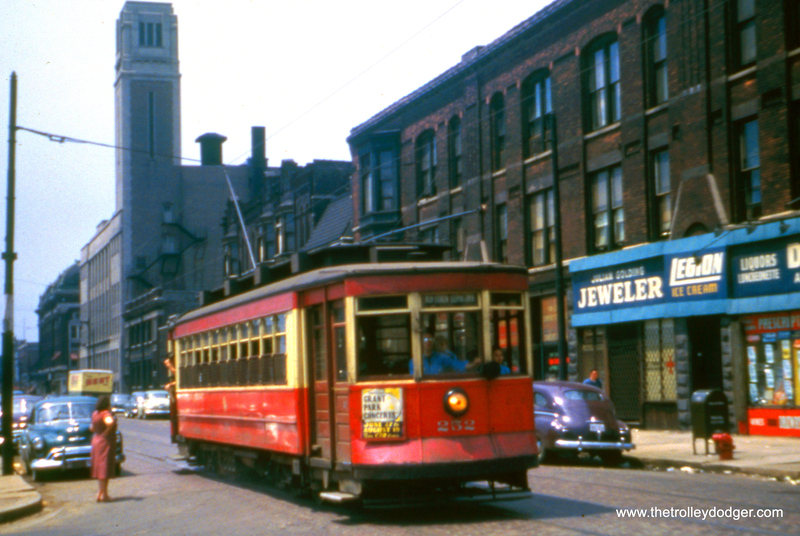 In the latter days of streetcar service on Halsted (1953-54), PCCs were replaced by older red Pullman streetcars such as this one. More progress has been made building the highway, as compared with the previous pictures. CTA 4387 heading north on Clark, just north of Devon. On page 241 in CERA Bulletin 146, there is a different picture taken near this location. This picture of CTA 528 was taken in January 1952 on Roosevelt Road near Ashland, where route 9 took a jog from Ashland to Paulina. There was a portion of Ashland where streetcars were not permitted to operate. 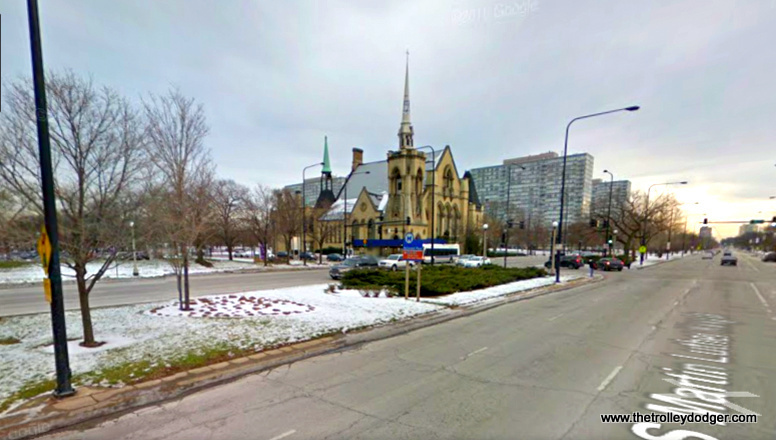 One of our readers asks, “Why is there a gauntlet track in the foreground?” This is a picture of Roosevelt and Ashland (the north side of the street), where two different tracks converged into one. First, there was the Ashland car line turning onto Roosevelt towards Paulina. The other track would have been for Roosevelt, since at this point the line took a jog, and went off onto a sort of “service drive” on the sides of the street. In general, Roosevelt ran in the main part of the street, except for the section between Ogden and Ashland, which used this arrangement. 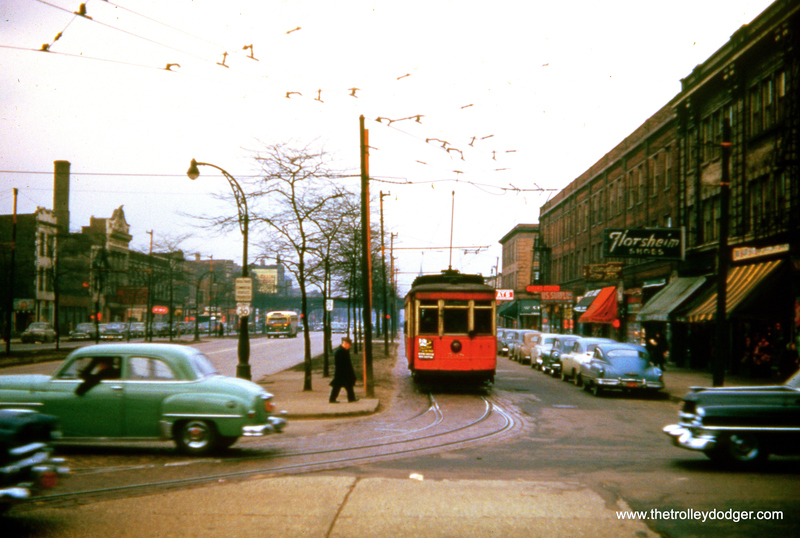 (This arrangement is no longer used here, and the area where streetcars ran is now covered with grass.) So the two tracks, coming from different directions, could have converged into one at this spot. This is shown on the supervisor’s track maps. Lending credence to my theory, you can see the “L” on Paulina in the background. The same view today, looking west from Roosevelt and Ashland. 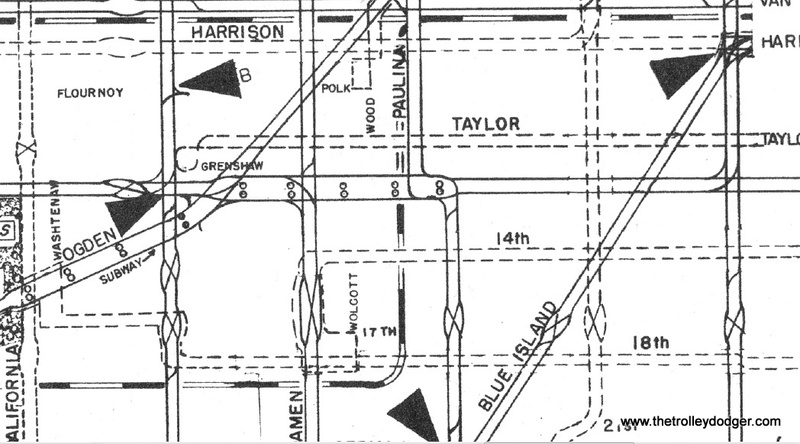 This is an enlargement from the 1948 CTA supervisor’s track map, which can be found in our E-book Chicago’s PCC Streetcars: The Rest of the Story, available through our Online Store. Roosevelt is the street between Taylor and 14th. CTA Pullman 136 on Roosevelt near Ashland. This is an Ashland car, making the jog between Paulina and Ashland, while the bus is serving Roosevelt. 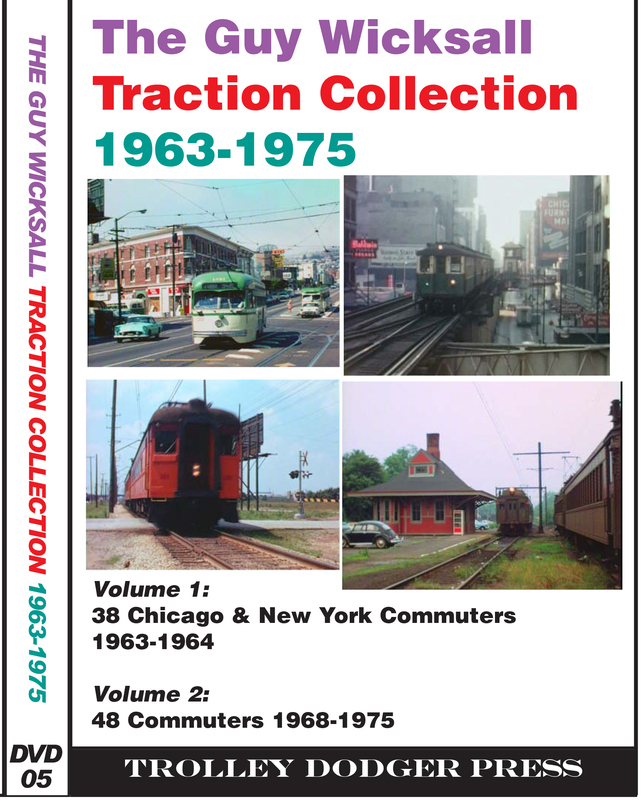 Daniel Joseph adds, “The 5000 series Twin Coach propane buses were not being delivered to Chicago until December 1950 according to the data in Andre Kristopans’ book.” So the picture cannot be earlier than that date. The marquee of the Joy Theater, located at 1611 W. Roosevelt Road, provides another clue. According to Cinema Treasures, “Located on the Near West Side, on Roosevelt Road at the intersection of Ashland Avenue, the Orpheus Theatre opened in 1913. The movie house was later operated by the Marks Brothers circuit, and still later, by the Essaness circuit. 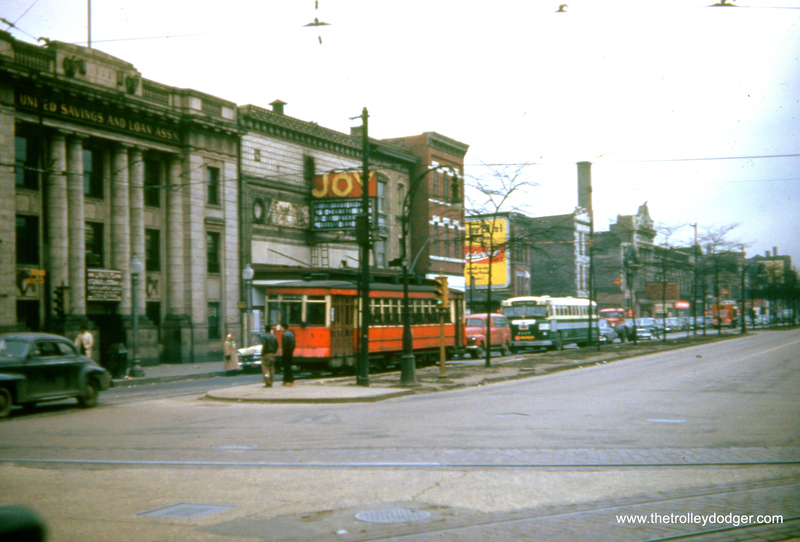 By the 1940’s, the theatre was renamed the Joy Theatre. In 1952, the Joy Theatre was acquired by the Gomez family, who renamed it the Cine Tampico, for their home town in Mexico. It was still in operation as a Spanish-language movie house by the mid-1970’s. A drive-up bank is located today where this movie theatre once stood.” That would make 1952 the latest date this photo could have been taken. The same location today. We are looking to the southwest. The bus is heading east, as was the streetcar in the preceding picture. 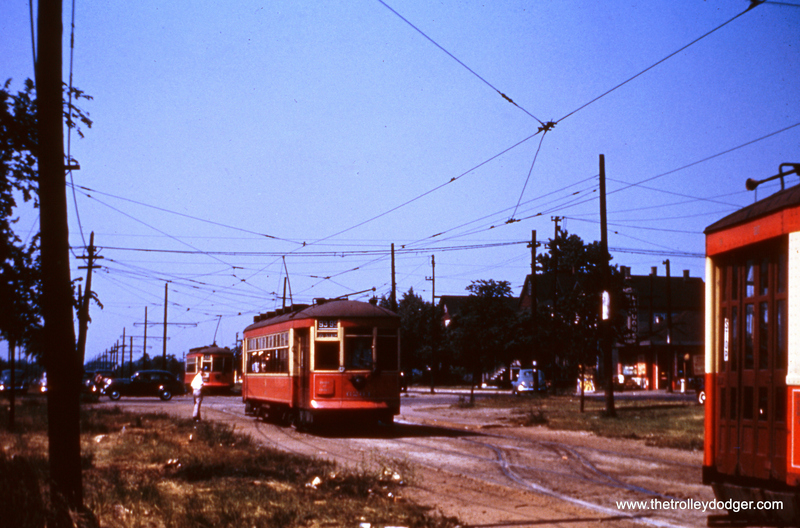 CTA 1745 is westbound at Lake and Long in June 1952 on route 16. 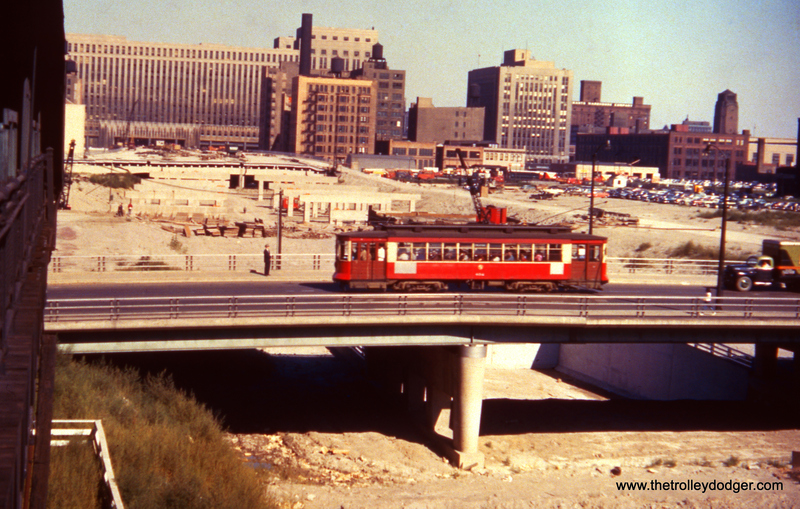 Here, it ran parallel to the ground-level portion of the Lake Street “L”, also under wire. Lake and Long today. We are looking east. 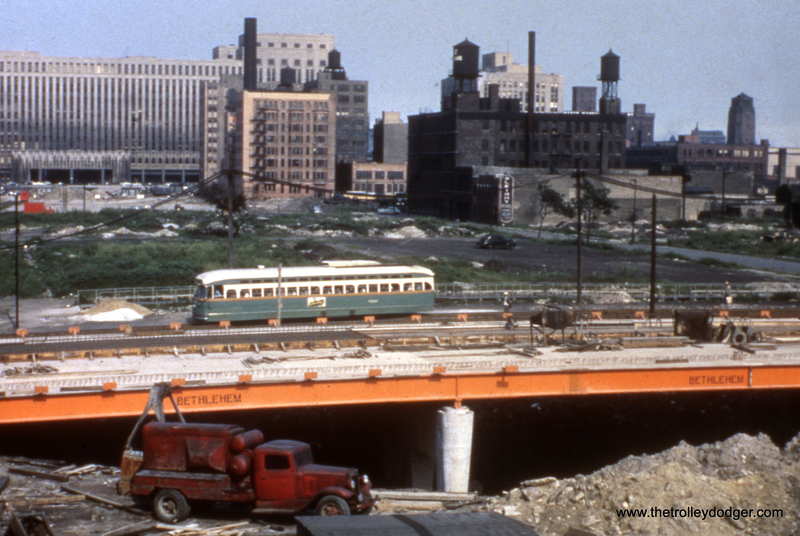 The CTA Green Line (formerly the Lake Street “L”) has run on the embankment since 1962 and connects with the steel “L” structure at Laramie. 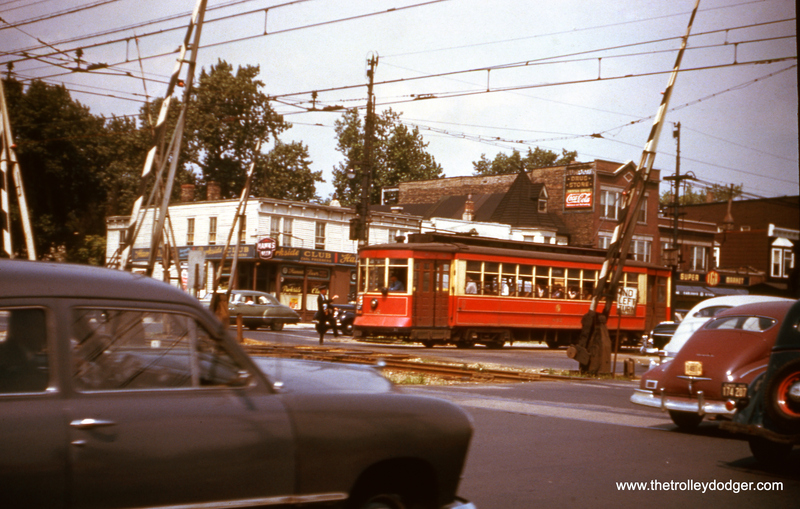 Here, we see CTA 1745 at Lake and Austin, the west end of route 16, on June 15, 1952. 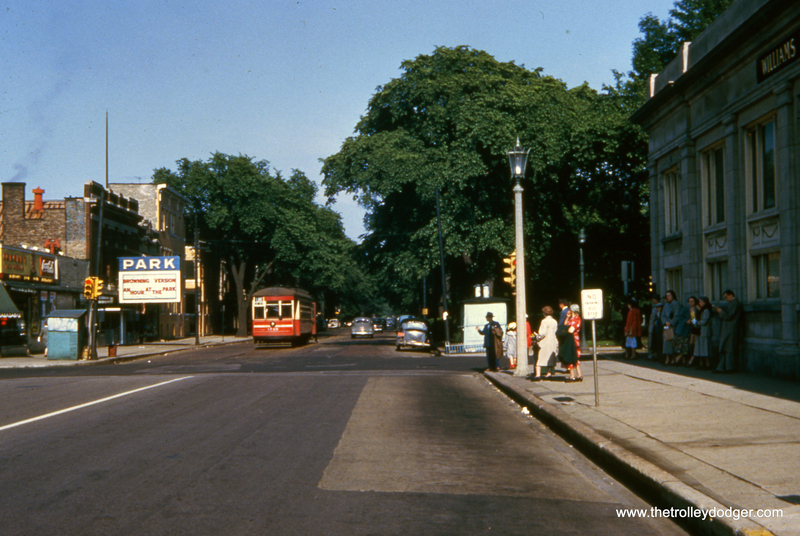 In this view, looking east from suburban Oak Park, the Park Theatre is still in business. 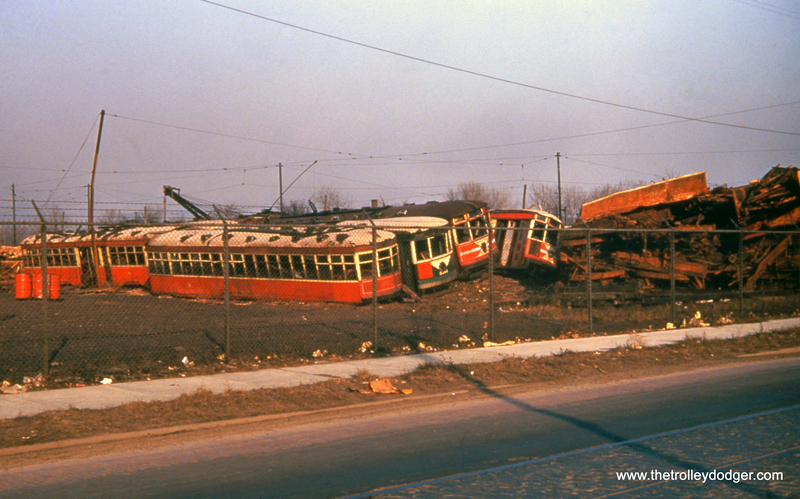 By the time streetcar service ended here in 1954, it had closed. 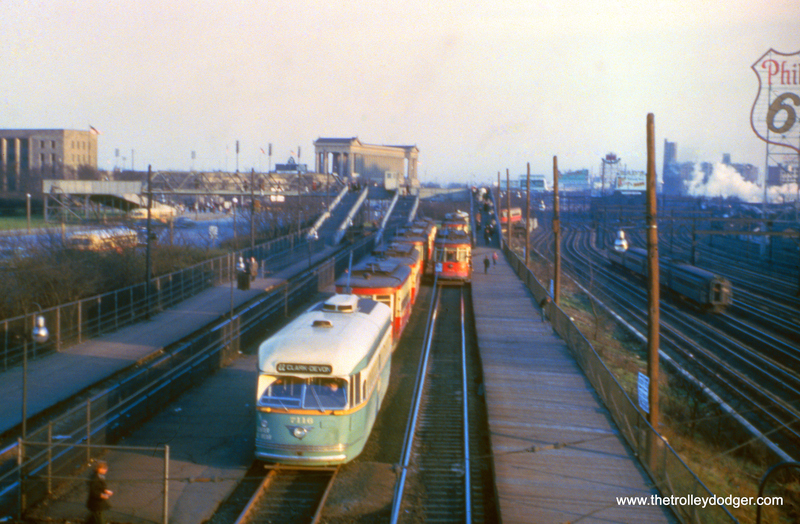 This view of CTA 1751 looks west from the Chicago side of Lake and Austin in December 1953. The movie theater has closed, and was eventually demolished. Riders heading west from here could take a Chicago & West Towns bus across the street. The Lake Street “L”, just to the south, continued west for another 1.5 miles. CSL Pullman 786 on Van Buren in February 1952. 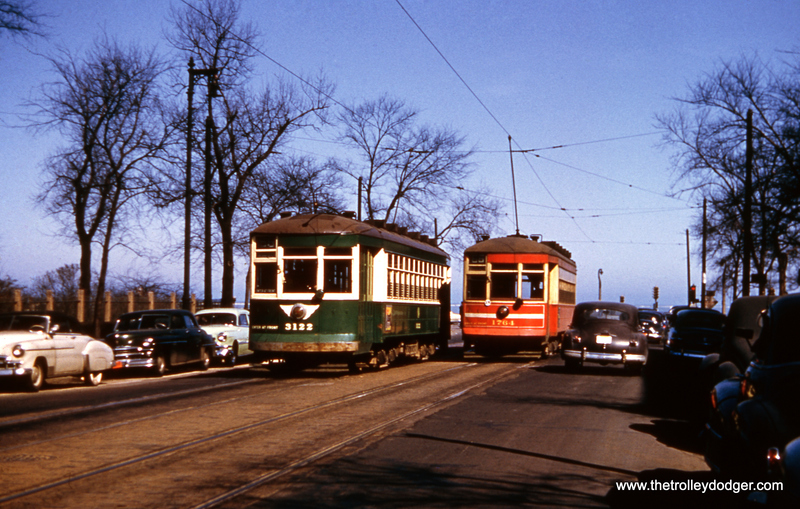 Among these red cars at 77th and Vincennes, we see CTA Pullman 142 at left in November 1949. 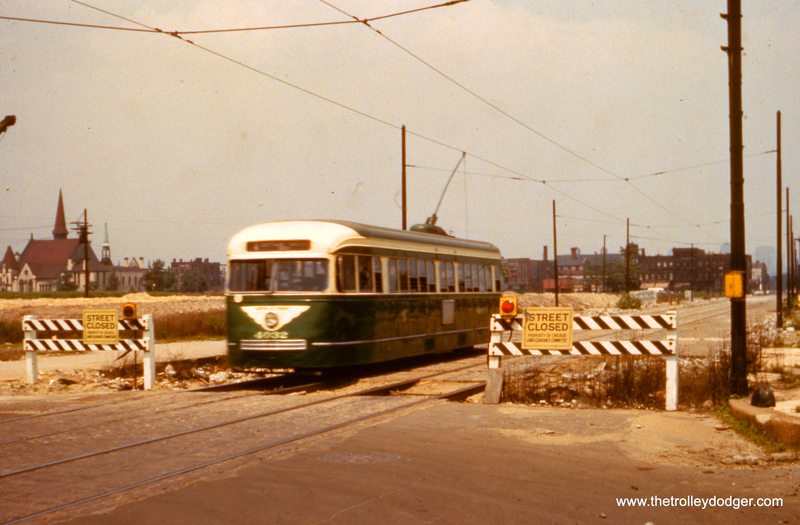 CTA 3277 heads north on Cicero Avenue near Cermak in October 1951, crossing the Douglas Park “L”. 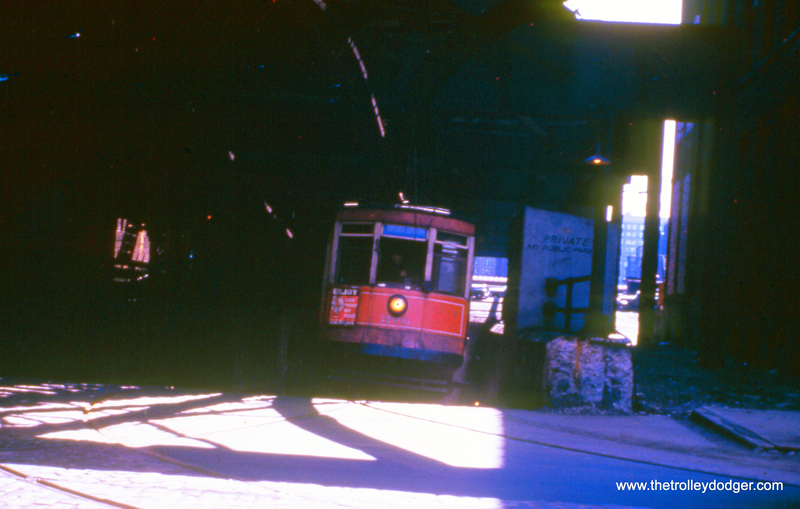 CTA 370 in the old Van Buren streetcar tunnel that ran under the Chicago River. This picture is dated October 1953. 71st and Stony Island today. We are looking north. 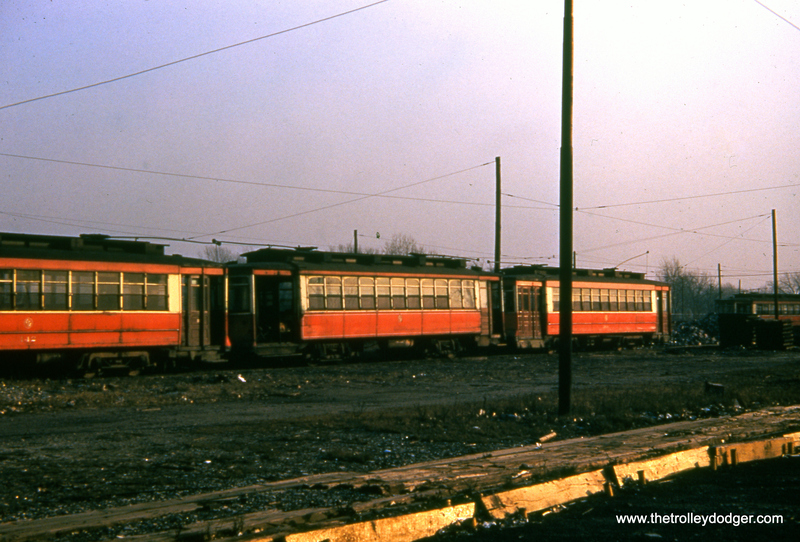 Several CTA Sedans (aka Peter Witts) in the scrap yard on December 26, 1952. These cars were part of an order of 100 built in 1929 and potentially could have provided many more years of good service. Unfortunately, none were saved. CTA 4011 and other PCCs at the west end of the 63rd Street line in December 1951. 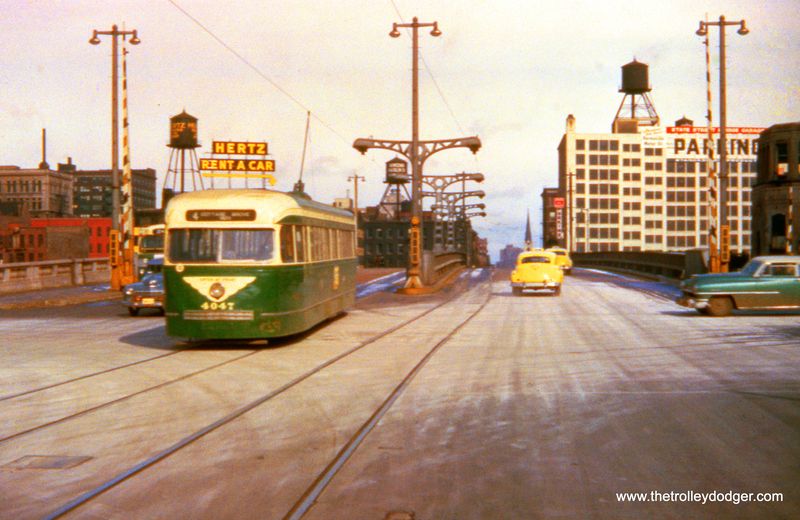 CTA 4047 crossing the Chicago River at State Street on December 7, 1953. This is a route 4 – Cottage Grove car. 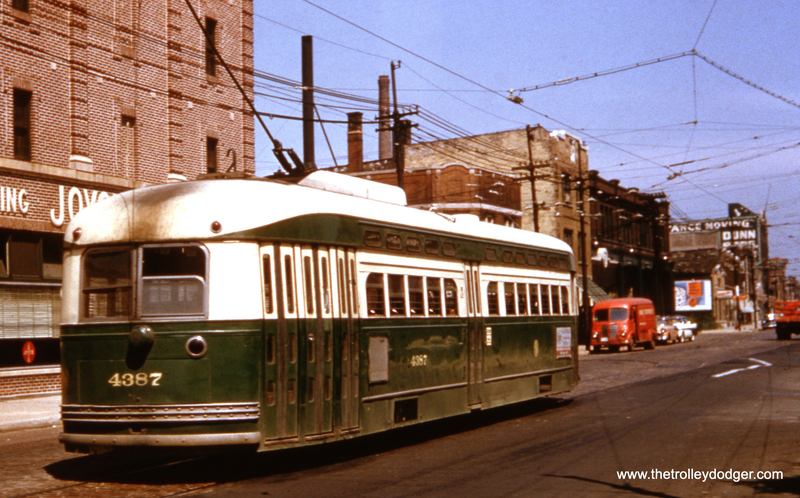 CTA Pullman 252 in the early 1950s at an unknown location. One of regular readers thinks this is “Van Buren, one block east of Ashland, with the car heading east.” If so, the date can’t be later than 1951. 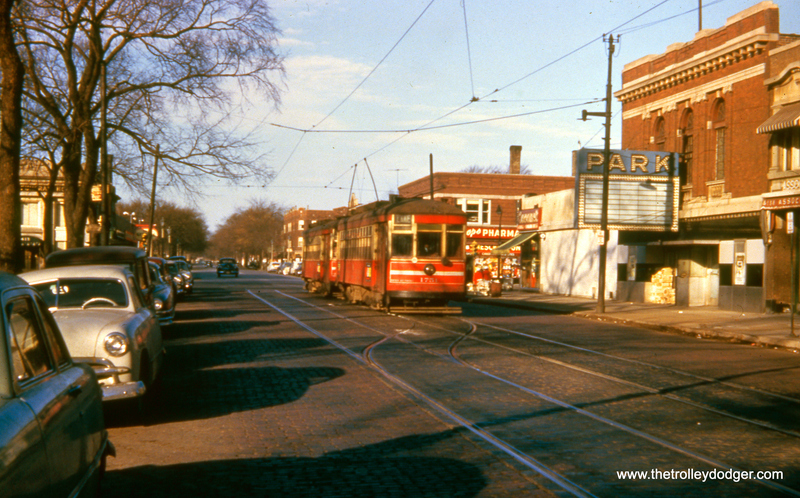 Streetcar service on Van Buren ended then to allow for construction of the temporary Garfield Park “L” right-of-way at ground level, which opened in September 1953. The same location today. We are looking west on Van Buren, just east of Ashland. CTA 6204 on 93rd at Stony Island Avenue in 1949. CTA 7197 is southbound at Clark and Thome. There is a similar picture taken at this location on page 155 of CERA Bulletin 146. CTA D-304, a sprinkler converted into a snow plow, shown at 77th and Vincennes in September 1951. CTA 3122 and 1764 at the east end of the Chicago Avenue line on March 29, 1952. 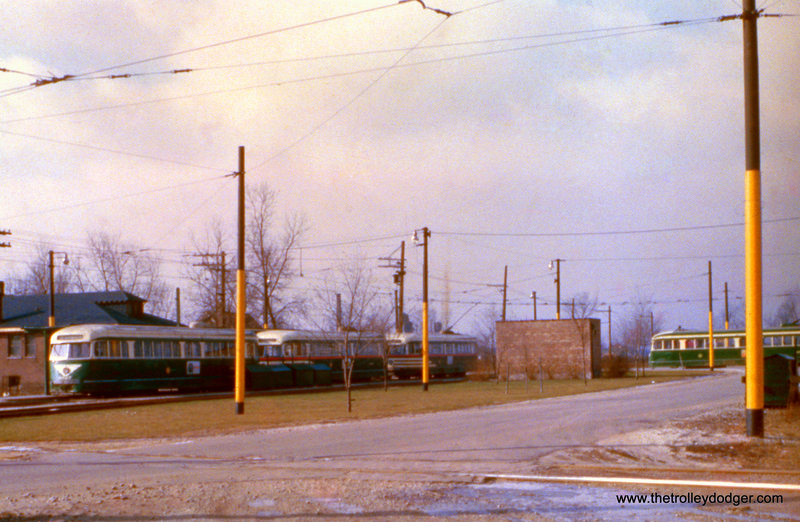 A few of the older streetcars were painted green, but I don’t know of anyone who preferred this to CSL red. This is our 163rd post, and we are gradually creating a body of work and an online resource for the benefit of all railfans, everywhere. To date, we have received over 211,000 page views, for which we are very grateful. pic of 812 might well be Stony Island and 71st. clues are, median streetcar ROW, and the name Parkside on the corner building. Parkside was the original name of the IC station at Stony Island. I agree. The view is NW. These photos are great! Thanks! The photo on Cottage Grove is facing north, probably at 33rd; the church in the left background is Olivet Baptist at 31st & King Drive. The photo at 71st & Stony Island could have been of a Stony Island car or a Windsor Park car, as the latter line diverged from Stony Island at 73rd St. Thank for the correction. The dates given were as marked on the slides, but could have just represented someone’s guess. The church in the pic with southbound Blue Goose 4032 is the Olivet Baptist Church. It is located at the south east corner of 31st Street and King Dr (South Parkway at the time of the photo). Our website: http://www.olivetbaptistchurchchicago.org. I am a member and know at least one other member who attends regularly lived in the neighborhood prior to the construction of the Lake Meadows and Prairie Shores apartments. Re Lake & Kenton – this CMC yard was operated by Wilcox garage, which was too small to accommodate all the assigned buses by the 1940’s. This yard was closed when Wilcox garage was closed and all its equipment moved to Kedzie, which had been a streetcar barn to that point. 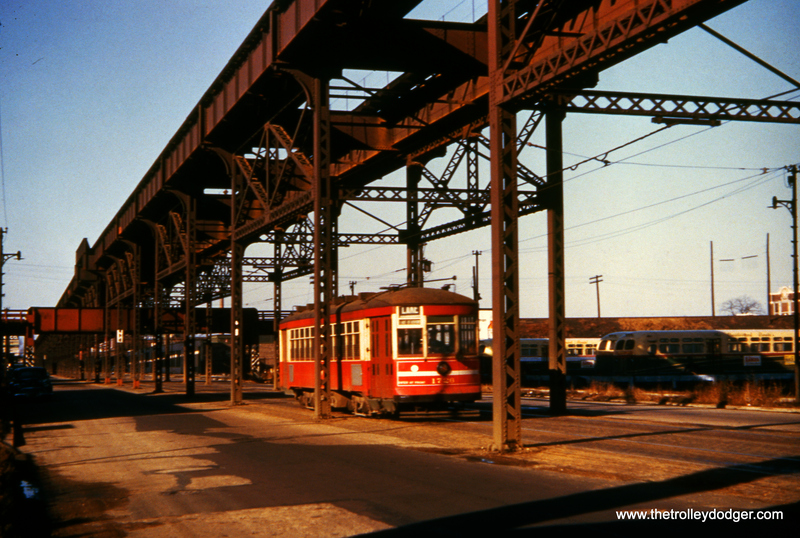 In the photo “CTA 3277 heads north on Cicero Avenue near Cermak in October 1951, crossing the Douglas Park “L””, is that the Western Electric plant in the background? Yes, that was part of Hawthorne Works. In studying 812 about to cross the IC Electric tracks I paused to check-out the visual detail of the CSL’s overhead wire crossing with the IC electric’s catenary suspension contact wire. What immediately comes to mind is that at two different service voltages, the IC electric service voltage is 1500 vdc while CSL’s was 600vdc, obviously effective electrical isolation is mandatory. The trolley wheel or carbon shoe at the end of 812’s trolley pole has a relatively small contact area as it picks up electrical current from the overhead. The IC electric’s pantograph’s*electrical contact horns are pressed upwards to the underside contact wire of the catenary, as the contact area of the horns is on a plane that is perpendicular to the catenary contact wire, the center one third of the electrical contact strip is normally in use under a straight section of the catenary. Click on the 812 photo and study the enlargement where the overhead wires of the two systems cross each other. Note how the CSL wires leading to the crossing point are a bit higher than the IC Electric’s catenary contact wire, note also how CSL’s wire drops down to the height of the IC’s wire at the small insulated crossing point and then back up again. This insures that the IC’s long contact strips on the pan’s horns slide under the crossing without the whole length of the contact strip encountering a length of the CSL’s wire along the entire horn’s current collecting strips length thereby causing a short-circuit and or the pan being fowled with the CSL overhead wire. Pretty elementary and clever design that did the job! 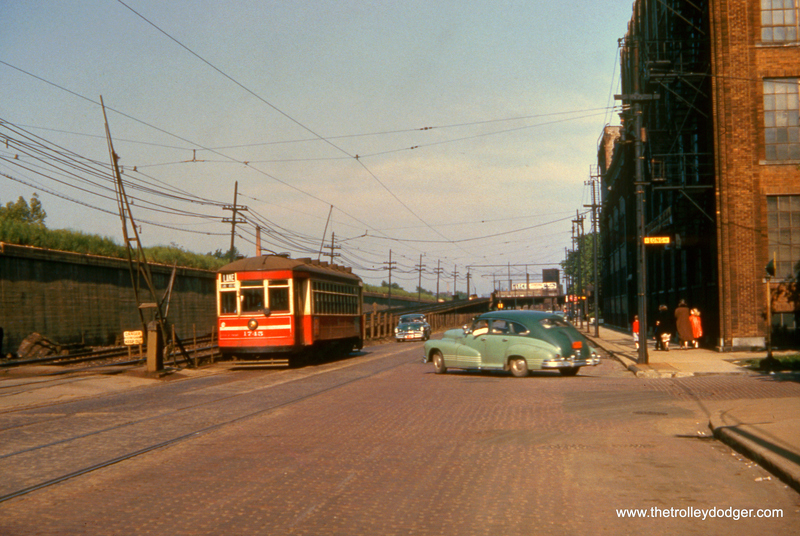 For what it’s worth, the wonderful photo of CTA Pullman 812 crossing the IC lines at 71st and Stony Island looks to be from the summer of 1949, judging by the license plates seen on the two cars on the right. The maroon car has a dealer plate (1487 A) and is dark on a light background. The black vehicle is wearing a standard 49 passenger. The colors would have been cream on blue for the passenger, and the opposite for the dealer. The passenger plate in the on-line photo seems dark – almost black, but film processing and photo reproduction can lighten or darken colors and not be all that noticeable when viewing the entire photo. 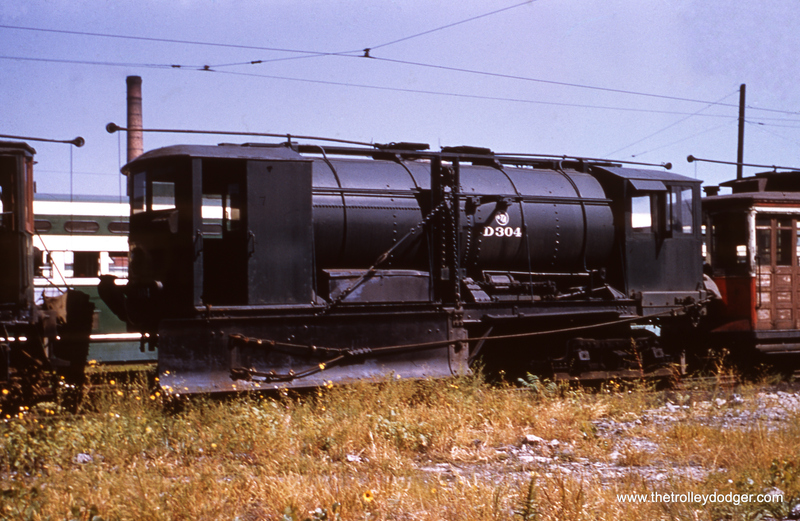 The text mentions 1948 – I don’t know if that date is presumed for the photo, but 48’s passenger plates were black on a orange background, and that orange would have been distinctive. The 48 dealer plates were a dark black opposite of that scheme. A number of fiberboard-plated years preceded 48, and the closest passenger colors before that were 1939. That year, “ILLINOIS” was on the top of a dark plate with yellow numbers, but read “39.” The plate in the photo reads “19 – something” (four digits in the year.) So it most likely is 49, and there simply weren’t any (much less two) 49 plates to be seen on the street in August of 48. The colors and designs of IL plates changed enough each year after 49 to be easy to pin-point.